Using strikes as a preparation to armlock is a characteristic feature of middle level kata of many Takamatsu-den Ninjutsu systems. Today we are going to venture further and train with a feature of upper level kata – The strike sets up the opponent for a predictable reaction thereby allowing an advanced joint lock or a throw. 5000 subscribers on our YouTube martial arts channel! Hei friends, we just passed 5000 subscribers on our Ninjutsu-martial arts channel. Today we will use some kata from Fudo and Koto ryu as a basis for Ninjutsu answers against a full clinch. 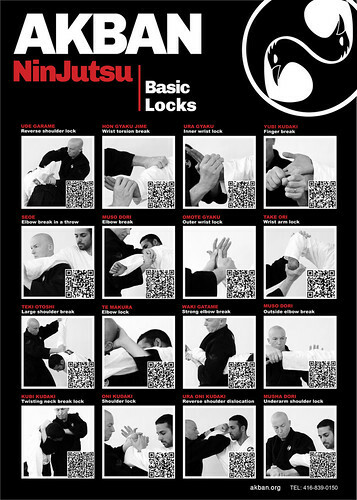 This useful syllabus also reveals an important aspect of advanced levels: preparing the opponent’s reaction by striking. In wednsday and Thursday we will not be conducting any training due to Independence day. Today, Thursday, at the eve of Yom Hazikaron we will train at the back of the dojo, at the yard, stopping our training session at the sound of the siren, at 20:00. We are expanding the striking reactions we learned and approach grappling through the Ninjutsu answers to neck and body clinch. This opens up even more possibilities at close range. I once read a great book, it was called “Enter to Trapping to Grappling“. In it the author developed some techniques that took Wing chun aspects of striking in close range and grappling. At the time, when striking arts ruled the magazines and grappling arts were a dedicated, professional but highly cloistered disciplines it was refreshing to see my teacher’s atitude echoed. Doron Navon Shihan, himself not only a Ninjutsu top teacher but a Judo 4th Dan, emphasized the necessity of grappling knowledge for all self defense situations, for many reasons. We do not need to look far, a through practice in Ninjutsu techniques reveals that a plethora of kata mix grappling, locking and throwing. After dedicating the previos weeks to honing sabaki and reaction we now open scope for the various ways the Takamatsu den syllabus deals with close range and middle range distances. “In ordinary speech, I want this, I like this, I care about this, are constantly used as equivalents for I think this good.